Mix the dry ingredients together in a bowl. Mix in one-third of the buttermilk, then another third, then the rest, making sure the buttermilk is fully incorporated each time before adding the rest. You may not need all of the buttermilk - stop if the dough begins to get sloppy. Roll the dough out into a rectangle on a floured worktop. Press it until it's a bit over a centimetre (half an inch) thick. Fold it in thirds, press it again, then turn it 90 degrees and fold into thirds again. Repeat this about 5 times, then wrap the rectangle of dough in plastic film and pop it in the fridge to rest. Break your sausagemeat into small pieces and cook them on medium heat in a lightly oiled frying pan. Try to break the sausagemeat into almost crumbs and when they are almost cooked, stir in the butter and get it fully melted. Now stir in the flour, mix thoroughly and cook it for a few minutes. Add as much flour as you can get absorbed into the mix. Now add half the buttermilk, stir well, and turn up the heat a little. Add the rest of the buttermilk and the salt, pepper and cayenne. Keep stirring until the gravy has thickened and set aside until needed. Preheat your oven to 190° C (374° F) if it's a fan oven, or 210° C (410° F) for a conventional one. Take the dough out of the fridge, unwrap it, and shape it into a neat rectangle. Using a dough scraper or ruler, cut the dough into 8 rectangles or squares (you can use any shape of pastry cutter you want, but with squares or rectangles you have no waste). Place them on a shallow baking sheet lined with greaseproof paper or a silicon baking mat. Brush the tops with buttermilk and bake for 12 minutes or until the tops are golden. Let them cool a little on a wire rack, then slice them horizontally and serve with reheated gravy. The video above is from the Keef Cooks YouTube channel. 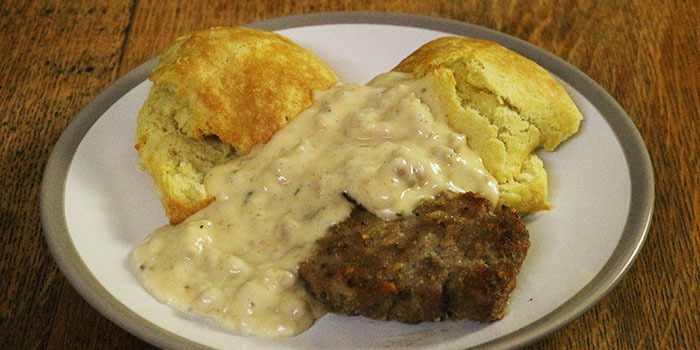 Click here to see the video recipe of Biscuits and Gravy on YouTube. In the gravy, salt, ground back pepper and a small bit of cayenne pepper to taste.